The weeds love it, all this mild and damp weather we’ve been getting lately. They seem to flourish in it, no matter how often I take the sprayer to them. But I tell you what else thrives in this moist and muggy atmosphere.....moss! Usually there is a light covering of it around the place, until I get round to removing it with a shovel. This year it is exceptionally thick, springy, and it’s growing in places that it’s never done before. I’ll never be able to remove it all by hand, not now it’s spread over such a large area. I’m going to have to go out and buy yet more stuff to spray. I’d not bother with it so much but it gets so slippery underfoot I’ve lost count of the number of times it’s almost brought me tumbling down. I’m walking along the driveway and it’s just beginning to get dark. Strange at this time of year to find a mild dusk but that’s what it is tonight. I trudge along, careful to miss the potholes that have pitted the tarmac. And then something catches my eye; a movement beside me in the mossy edge. What is it? It’s very small. A mouse maybe or a vole? 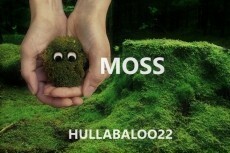 But no, neither of them because this little critter is green, the exact shade of the moss it is moving through. Perhaps I should have paused to consider but I wanted to get a better look at whatever it was. I bent down, put out my hand and caught it. I could feel it moving around on the palm of my hand, pushing against my fingers. Damn it all, I was not going to hurt it, but I was not about to let it go before I got a better look. I lifted my hands up and opened my fingers slowly, carefully. On my palm stood a peculiar little creature. It was surprisingly heavy for a lump of moss, plump-looking and short. I couldn’t make out any arms but I could feel it’s feet even though they are not visible. The strangest thing about it by far is the largest pair of eyes looking directly at me. It seems to be weighing me up as much as I am it! It doesn’t seem scared and it doesn’t seem hostile. Just interested! I lift my hands up towards my face so that we can get a better look at each other, maintaining eye contact all the while. It doesn’t seem to feel the need to blink, not even once. Taking me totally unawares, it launches itself straight towards my face. I’d not noticed it had a mouth, but it does and it’s one that is equipped with very sharp teeth. They sink hard in to my nose, my chin, and several places on my hand. I drop it, planning to squash it underfoot but it escapes, instantly camouflaged by the moss on the ground. The bites hurt. Hurt a lot. It is light enough for me to make them out. They must be bleeding but when I look there is no red – not a drop. But what there is, emerging from those vicious holes left by those fang-like teeth, is moss. I have moss springing out from inside my skin. In horror, I reach up and touch my face. I can’t see it but I can feel it, a fluffy, springy growth. Already it has covered up my hands and is spreading its way up my arms. Forget vampires and their thirst for blood. Keep your eyes peeled on that green innocent looking blanket or you might just find yourself being turned into a moss man. Just like me. Generally, Moa, I don't spray either but use a shovel. It is true though that there is a lot more of it around this year. No little, or large, moss men yet though. Thanks for reading! The Moss Man. Brilliant Hully! I actually enjoyed writing this, Sue. We do have a lot more moss than usual here this year. Get rid of one bit and another bigger patch appears. I've not seen any little moss men but I thought it was a change to a vampire story. Not that I don't enjoy writing them too! Honestly, we have got way more thicker moss than usual. It loves the humidity we've had this summer and the warmer than usual temperatures we've got now are making it thrive. I've not actually found any little moss men yet but you never know. I see that you are still in Halloween mode with the terror stuff. A moss man would at least be more cuddly than a vampire, albeit a little damp, perhaps. Oh, yes, Joe. Not entirely but I'll be trying to put out more halloween type stuff for the month. I enjoy writing it anyway. And damp -- yep. Pick up a lump of that mossy green stuff and it's rather like a soggy sponge. Thanks, jaylisbeth. And we really do have a lot of moss around at the moment! Dont dream too high, Things might crash down before u get a chance to fly! WHAT A DROWNED MOTHER WANTS.